I’m still playing catch-up on my UK trip. Tim arrives in 25 days for his US visit, so I thought I ought to try and get things caught up! Tim had a long weekend coming and we were trying to decide what to do on it and where to go. He handed me this big map book he has of the UK (complete with a mini visitor guide. This book is amazing and helped us plan several of our other trips!). I opened it up to the front page that shows all of the UK, and after two “splashes” (finger pointing at the Irish Sea), I landed somewhere in the Northeast. I think I landed specifically on Newcastle-upon-Tyne, or it might have been Durham. Either way, it sparked off a weekend in the Northeast! I was googling for things to do, and Tim remembered a place called Beamish. One look at the webpage, and I told him we had to go there! Our weekend started off the day after one of the snow storms that swept across the UK. Actually, the storm that hit London the day before we left was the first big snow storm to hit London in 18 years! Since it wasn’t too bad in Lincoln, we decided to head on out anyway. I scored us a great deal on a hotel again, this time staying at a Holiday Inn a little bit north of Newcastle, for about half the price of even the local bed & breakfast! We settled into our hotel that evening, and planned on heading out to Beamish in the morning. It snowed overnight, but only a light dusting. 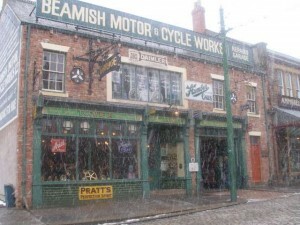 We headed out to Beamish, and right when we got there it started snowing harder! What perfect conditions to explore 1913! 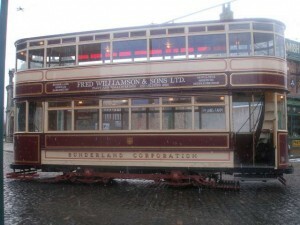 Beamish is an open air museum designed to give you a glimpse of life in 1913 Northeastern England, and 1825. During the winter months, the 1825 section is closed, so you can only visit the 1913 town. Fortunately, the trolley was running, so we hopped on the trolley and it took us back in time to 1913. Our first stop was a masonic temple, originally from Sunderland. The front of the temple was brought over brick-by-brick, but the inside was built new from the old plans. Our guide told us all about the secret society and talked about how to join the Masons. It was pretty interesting, but I lost interest after being told women couldn’t join! They also offered the opportunity to go upstairs, but I didn’t want to climb the steps. Next to the temple was a branch of Barclay’s bank. A teller sat behind the counter working on needlework, waiting to show off the coins and bills used previously in England. We also took a trip downstairs and got to see the old fashioned vaults and deposit boxes. Wow, glad I wasn’t a banker in 1913! After a stop at the (thankfully modern!) toilets, we moved onto some of the shops in town. The people in the confectionery told us to come back later if we wanted to watch a demonstration, so we headed to the Pub for a cup of tea to warm up with before heading back in. We got to watch how Toffee is made,and got samples fresh off the block! Tim and I picked up some old fashioned candy (at old fashioned prices!) to nibble on for the rest of the trip. Across the street was the large co-op, where people could buy everything they needed for their homes, from washing machines and dishes to food and clothing. The shopkeeper explained everything to us, and showed us a very clever way of taking cash from customers. The shop had an overhead system of “rails”. Run completely by gravity (no electricity here! ), the counter person was able to put the customer’s bill and money into a hollow croquet ball. Then, she’d put it onto the “track” and the ball whizzed it’s way back to a separate locked office where the cashier would take out the money, put change and a receipt in, and send it back to the counter person. This way, all the money was kept behind a locked door and it was actually a lot safer than most stores today! Further down the block was a printing shop, where we got to watch the typesetter set the newspaper, and then used the press to make a “I’ve been to Beamish!” sign for a souvenir. We skipped a few of the houses/offices and some of them weren’t open, but we did get to glimpse in the law office, and into the kitchen of a typical 1913 home. Further down the block, we got to the Railway station – Tim’s favourite place! 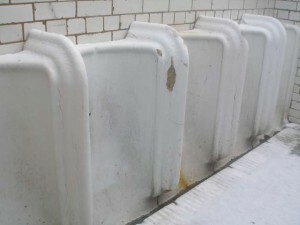 The station wasn’t open, but we took a few photos and got to see the Westoe Netty – and outdoor public toilet for men made famous by a 1972 painting. The toilet was built in the 1890s (and also the third old-fashioned toilet display we saw on my visit!). On our walk back we stopped in at the stables and the garage before taking the trolly back to the entrance. We packed a picnic lunch, but supplemented it with some soup from the cafe. We both had a great time, and I look forward to going back with Tim next Summer when we can see everything else!